US President Donald Trump approved safeguard tariffs on imported large residential washing machines and solar cells, as announced by the US Trade Representative on 22 January. This development will affect trade with China and South Korea. Will there be more protectionist measures to come? 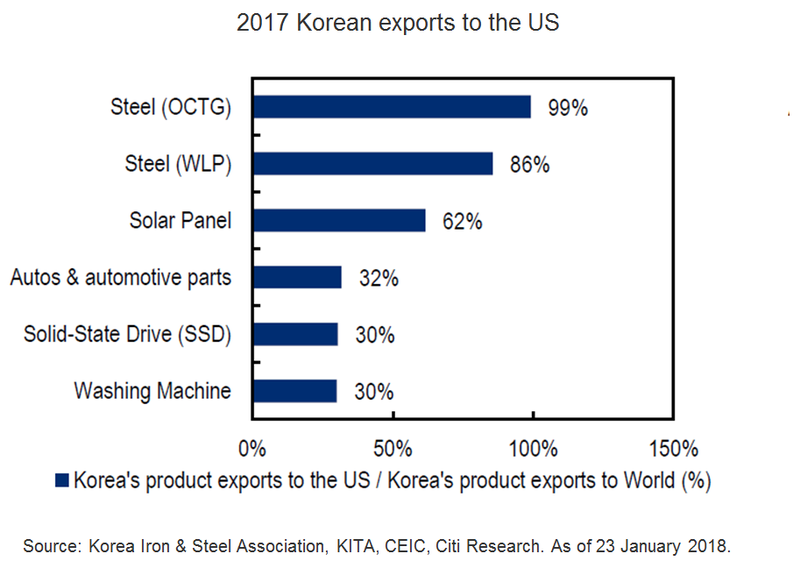 As shown in the chart below, around 30% of Korean washing machines and 62% of Korean solar panels were exported to the US in 2017. Korean media have reported on 23 January that around 60% of Korean washing machine exports to the US could be levied with 50% safeguard tariffs during the first year. They also noted that solar cell exports to the US may contract 10-30%. However, Citi analysts believe that trade protectionism risk is unlikely to deter overall growth of exports. Korea's four items (washing machines, solar cells, welded line pipe and oil country tubular goods) may suffer from safeguard tariffs and Section 232 investigation. However, these four exports to the US accounted for only 0.46% of total exports in 2017, suggesting limited negative impact to the economy. Citi analysts view trade tensions as the largest near-term risk. NAFTA negotiations as well as ongoing reviews over steel, aluminum and China's intellectual property practices are all potential flashpoints. Citi analysts also expect the US to increase its use of trade restrictions in coming months, particularly with the aim to rebalance trade with China. The Chinese response is likely to be measured, in Citi analysts view. However – despite headline risk – Citi analysts think the actual trade action and impact will remain contained and is unlikely to affect Asia's positive cyclical momentum. Stay tuned for more updates on Market Insights by Citibank.